I didn’t win the war. Or even the battle for that matter. But I did win the – I don’t know – skirmish, I guess. Congratulations to Henry Neff on winning Best Book for The Hound of Rowan at Woozles‘ Battle of the Books. 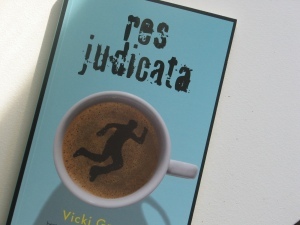 I was pretty happy that Res Judicata won for Best Plot. Now I’m girding my loins for another battle. I just found out that Not Suitable for Family Viewing has been chosen to compete next year. Onward to Victory! Thanks to Suzy Crocker, Lisa Doucet and all the teachers, kids and volunteers who make this great event happen. And congratulations to Sacred Heart for winning a hard-won fight against LeMarchant-St. Thomas.